"Making things happen by cultivating the drive and attitude of our youth that leads to their success through education, sports, and services." The Joe W Gilliam Foundation (JWGF) was established in 2000. As a part of the JWGF efforts to educate, inspire, and give back to the youth in the community, we are committed to the causes that reflects the values embodied in our organization. We set an example for youth in the community and strive to establish the necessary tools and foundation to reinforce the values that lead to their success. Joe W. Gilliam, Jr had a vision and a passion to give back. He recognized that programs like the JWGF were vital to serve the best interest of the community. Because of his vision, the JWGF is able to provide the youth in the community and others an opportunity to learn how hard work, discipline, leadership, integrity, accountability, and diversity are key factors for their success. To cultivate the drive and attitude of our youth that leads to their success through education, sports, and services. To shape the future by providing opportunities and helping our youth realizes their full potential. Our values are built on hard work, discipline, leadership, integrity, accountability, and diversity. 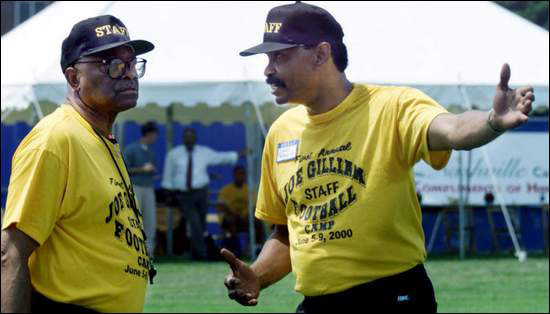 In the spring of 2000, Joe W. Gilliam, Jr., his childhood friend, Howard Gentry, Jr., a local government official, along with a local businessman, David Dingler, brainstormed a football camp for inner city youth. Their overriding concern was that limited economic advantages available to youth in urban areas prevented them from attending and benefitting from area football camps run by professional coaches and athletes. © Copyright 2017. All Rights Reserved. Joe W Gilliam Foundation.